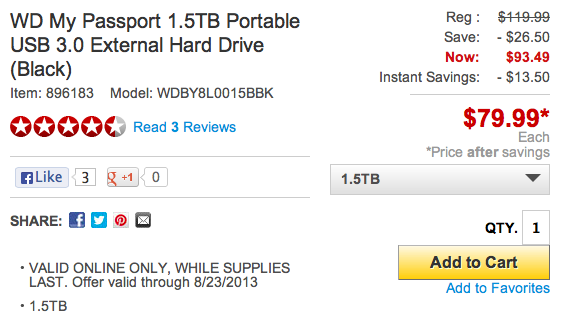 Staples is offering the Western Digital 1.5TB portable USB 3.0 external hard drive for just $80 with free shipping. That is $40 below retail and $10 under the next lowest price. As a further price comparison, most retailers charge upwards of $130. Deal ends 8/23 or when supplies are exhausted. This drive is a slam dunk. Nearly 4,000 Amazon reviewers rate it an impressive 4.5 stars. A perfect option for full-system Time Machine backups or a place to offload some of your larger media files. The USB 3.0 speeds will ensure quick file transfers. Don’t worry if you have an older Mac/ PC, the WD Passport is backwards compatible with USB 2.0.